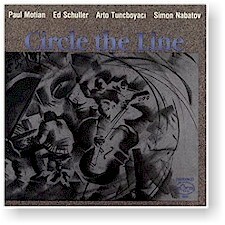 Circle the Line features the dynamic composer/performing talents of pianist Simon Nabatov and bassist Ed Schuller, propelled by the drumming of the legendary Paul Motian and the exotic Arto Tuncboyaci. In addition to six original charts, the band offers compelling renditions of Billy Strayhorn's "Lush Life" and Mellin & Wood's "My One and Only Love." Also available for downloads on Apple Music as well as Amazon, Rhapsody, eMusic and other digital sites. Recorded in June 1986 at Classic Sound in New York.